In 2017, Taganrog Sea Commercial Port (TSCP, a company of UCL Holding) handled 1.59 mln t of cargo, which is 48% more than in 2016. TSCP attributed the growth to the increasing demand for the port’s key types of cargo and resumed imports from Turkey. Transshipment of general cargo surged by 73% to 221,000 t including 112,000 t of ferrous metal and pipe products (+35%) and 109,000 t of cargo in big bags/boxes (up 3 times). The surge was also driven by imports of new cargo - ferromanganese. Considerable growth was demonstrated in the segment of dry bulk cargo, up 54%, year-on-year, to 1.26 mln t. Having put into operation the Gottwald HSK 170 EG portal crane and a 14 cbm grab bucket the company was able to boost its performance and meet the flow of coal taking into consideration the increased number of coal ranks: the company’s throughput grew by 26% to 755,000 t. Transshipment of ore surged 2.5 times to 77,000 t. Transshipment of grain doubled, year-on-year, to 398,000 t amid the improved market situation and high yield of grain in Russia. The company also handled 32,000 t of pet-coke which was not handled in 2016). Transshipment of liquid bulk cargo fell by 11% to 100,000 t.
Container throughput of TSCP climbed by 4% to 2,800 TEUs (6,200 t). In the reporting period, the company handled 1.29 mln t of export cargo, 101,000 t of import cargo and 193,000 t of coastal trade cargo (82%, 6% and 12% of the total throughput accordingly). A total of 16,562 rail cars and 401 vessels were handled at the berths of TSCP in 2017. 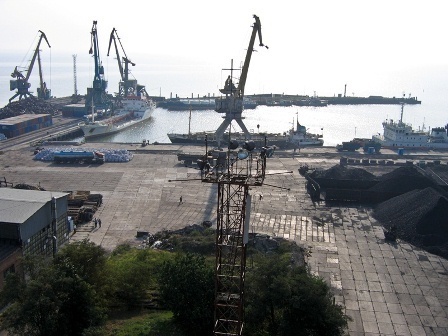 Taganrog Sea Commercial Port JSC (TSCP, a company of UCL Port, stevedoring division of the international transportation group UCL Holding) is a key stevedoring company operating at the port of Taganrog. The company operates at the port’s Berths No 1, 2, 3, 4, 5, 7 and 8. In 2016, TSCP handled 1.07 mln t of cargo.